The Finish Line! - You CAN Go the Distance! Congratulations, you did it! You have crossed the finish line! It has been a long, enjoyable journey and your marathon training paid off. For me, there are not many things more satisfying than the feeling I get every time I cross the finish line of a marathon. It is an exhilarating feeling of accomplishment! Regardless of how I feel, physically, or how well I performed in regard to my goal, the satisfaction of crossing that line after running 26.2 miles is one of the best feelings in the world! No matter how close you came to your time goal, you should be very proud of yourself. You are now a member of a very exclusive club. You are now a Marathon Runner. Less than 1% of the people who live on this planet can make that claim! One of the first things I would like you to do is to tell the world about your accomplishment. Post your accomplishment on all of the social media platforms. Put in on Facebook, LinkedIn, Twitter, etc. Tell the world what you did. It is perfectly OK to boast about this achievement and you deserve some applause. My goal for the 2012 Richmond Marathon was to finish in 3:30:00 (3 hours and 30 minutes) and, at the age of 49, would qualify me for the Boston Marathon. I will spare you the suspense and say that I did not hit that goal. I completed the marathon in 3:50:37, but I am still very pleased with that result! I am still pleased with the result because of something that I was able to accomplish that is often harder than the physical effort required to run a marathon. I won a major mental battle! I was able to fight off the feelings of disappointment and depression and was able to reset my goal mid-race. I started the race very intentionally watching my pace to make sure I did not go out too fast! While it still feels awkward every time I do it, I used Jeff Galloway’s run/walk/run method throughout the race. This means I ran at a 7:45 pace for 2 miles and then walked for 30 seconds, keeping my pace at a 8:00 average. At 10K, I was feeling great. I crossed the 10K timing mat at 49:25, which was a 7:57 pace and slightly ahead of my goal. I crossed the 13.1 mile timing mat in 1:45:05, an average 8:01 pace. I was still very pleased with that time given the significant hills I had just come through. While I was trying to “race” the marathon and to maintain my target pace, I had a very important stop to make at mile 14. My mother and my youngest son, Carter, came down to cheer for me along the route and they were there to greet me at mile 14. Even though my mother encouraged me to keep going and just wave to them, there was no way I was going to run past my boy without stopping to give him a big hug and kiss, and that is exactly what I did! The stop cost me about 15 seconds, but the look of happiness on my son’s face, knowing his daddy loved him enough to stop for a hug, gave me the emotional boost to make up the time and I still ran that mile in 7:46! Captain, We Have a Problem! While training for this race, I developed a Morton’s Neuroma in my right foot. Although it was painful, I trained through it and hoped for the best. During the race, however, I must have been compensating for it more than I thought and, 16 miles into the race, my left knee started to get very sore! Just before mile 18, I stumbled and my left knee buckled underneath me and I knew the “race” was over. Nevertheless, I was pretty sure my knee would hold up for the rest of the course, but not at the pace I was going. As I walked into the water station at mile 18, I knew I had to make a choice about the rest of the course. The way I saw it, I had three choices: I could quit and get a ride back to the finish area; I could continue to run and try to get as close to my goal as possible despite the pain or risk of injury; or I could just let go of the goal, relax, and finish the run at any easy pace, enjoying the fans, bands and beautiful weather. I chose to let go, relax, and just enjoy myself! I must admit it took me another two miles before I was able to shake off the disappointment and rearrange my attitude. The crowd made the difference! Even though my knee was throbbing and I was walking more than jogging, there were scores of people on the side of the road cheering for me and encouraging me to keep going. There were smiling kids with their hands out asking for Hi-Fives as I passed by. How can you not keeping going with that kind of encouragement? So, with a new goal of just having fun and enjoying the crowd, the sights, the sounds and the gorgeous mid-60 degree weather, I set back into a steady jog. The rest of the marathon was spent with a smile, and the occasional grimace of pain on my face and a new sense of satisfaction that, even though I would not reach my initial goal, I would be able to overcome the potentially biggest obstacle we face: a bad attitude. Perhaps the most satisfying thing that has ever happened to me during a marathon happened at mile 24, with just 2.1 miles left to go in the race. I jogged up behind a lady who was walking and crying. I stopped, walked along beside her and asked her what was wrong. (Please keep in mind that during a marathon, your brain can really play tricks on you and you can become, literally, disoriented to your place and time.) Sobbing, she said that she, too, had been trying to qualify for Boston but had run out of steam a few miles back. She was so disappointed in herself and I knew that feeling. I stayed with her and we started jogging again. There were a few more times she wanted to stop, but I encouraged her to keep going. Once we rounded the last corner in downtown Richmond, we could see the finish line and it was all downhill. “You’re going to make it!” I said to her and pointed to the finish banner! She crossed the finish line and qualified for the Boston Marathon with 12 seconds to spare! I was so proud of her! Her family was waiting there for her and I lost her in the crowd. I never even learned her name, but my heart was so happy for her! As for me, I crossed the finish line with a time of 3:50:37, 20 minutes shy of my Boston goal, but I had accomplished something more. To help someone else reach their goal is, for me, a much more fulfilling thing! Any chance of disappointment creeping back into my brain was crushed by Bart’s hug and encouraging words! Thanks, Bart! You rock too! So there you have it. My 2012 Richmond Marathon experience! Thank you for reading my book! 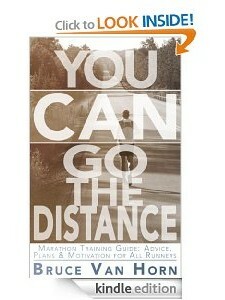 I hope I have helped you realize that you CAN go the distance! All you need to do is try! If you’ve run a race, a marathon or any other distance, I’d love for you to share it with all of us in the comments box below! 5 Responses to The Finish Line! That’s an awesome time! Training running is a great experience. I’ve only run a few, but have enjoyed it very much!